First-time Hot Chocolate Festival participants for 2014 include: East Van Roasters (Gastown), Last Crumb Bakery & Cafe (Main St.), Koko Monk Chocolates (Kitsilano) and UVA Wine Bar (Downtown), as well as four new franchise owners from Blenz Coffee. 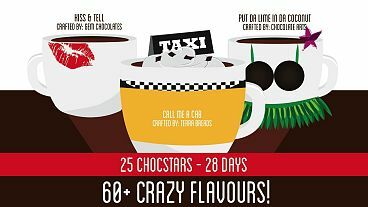 Cool factor…this year for the first time, vendors Chocolaterie de la Nouvelle France and UVA Wine Bar will be offering the option of cold, hot chocolates. Plus the flavour in the cups of hot chocolate at Bella Gelateria will be inserted via gelato master James Coleridge’s new ‘gBARs’ (frozen gelato on a stick). Mixologist Lauren Mote (UVA Wine Bar) will be breaking our former rule of ‘no alcohol’ with four cocktails inspired by traditional hot chocolate. Two without alcohol (one hot, one cold) will be available all day, while those of the boozier sort (crafted with Mote’s own Bittered Sling extracts) may only be sipped in the p.m. Walk it off.…along with bold and whimsical new logo graphics by artist Stephanie Gilmour, this year we will also be providing a walking map to the neighbourhoods where our vendors are located. Visit the website for a downloadable PDF, or a list where the large format printed versions may be picked up. With over 60 flavours to choose from, it’s going to take at least a month to try them all. Trend observers won’t be surprised to see salted caramel, Earl Grey tea and cardamom as popular flavour choices again this year. But if they’re looking for something a little edgier, they will find plenty to tempt their curiosity. * PARMESAN: The “Phaun’s Fancy” from Cocoanymph‘s lineup (named after the Classical Gods), unites chocolate with cheese and nutmeg. * LICORICE: Kerrisdale’s Gem Chocolates makes a “Twisted Romance” of Belgian chocolate and Australian natural black licorice. * CURRY: Festival newcomer, Koko Monk Chocolates will fly chocolate lovers straight to Bollywood with “The Brunette Bangle”. * POTATO CHIPS: Ouch! Mink Chocolates takes a playful stab at the Food Network with “Paula Dean’s White Trash Train Wreck” – a caloric spectacle of milk chocolate, condensed milk, salted Kettle Chips and whipped cream. * CABERNET: Wine lovers will want to take a spin with Terra Bread’s “Call Me a Cab” – a joy ride of chocolate, red wine, cinnamon and pear. * PEPPERMINT & TUMERIC: Groovy, baby! Leonidas Chocolates captures the artistic temperament with “Boho Secret” – a performance piece of honey, black pepper, peppermint and turmeric. * FOREST FIRE FUMES: Take the batteries out of the smoke detector! Thomas Haas Chocolates’ “Campfire” will be smoldering with smoked Hawaiian sea salt and smoked caramel. * And meanwhile … localvores should not overlook Soirette Macarons & Tea. The drinks at this Coal Harbour sweet shop and café have been inspired by the Vancouver landmarks of Stanley Park, Chinatown, Grouse Mountain and the Granville Island Public Market. A cup of cedar-scented “9 O’Clock Gun”, anyone? Hot chocolate purists need not fret. Most of the vendors will be serving at least one drink featuring unflavoured, hi-cocoa content chocolate only. Thierry’s “Apamakia“, for example, will be made from a special plantation-grown cocoa that is exclusively available at their Alberni Street patisserie and cafe. Now while you can’t get around the fact that these drinks contain sugar, beyond the pure, high antioxidant-rich dark chocolate, several vendors will also be upping the health quotient with coconut, soy or almond milk, as well as 100% vegan ingredients. Look for these marked on the menus at French Made Baking, Schokolade, CocoaNymph and Chocolateria de la Nouvelle France. Regardless of flavour, all drinks are guaranteed to be deliciously photogenic, and in that light, festival goers are invited to enter photos of their drinks to an online contest that could earn the lucky winner a set of gift certificates from all participating vendors. It’s a $500 value and a great way to extend the Festival throughout the year. The lights of Christmas may be gone, and it’s going to be a long grey stretch until spring, but if anything can banish the chilly gloom of January, this cheerful Festival can. After all, it’s a scientifically proved fact that “CHOCOLATE MAKES YOU HAPPY”. Click here for photo contest details. Click here to view 2014 funds recipient.